Support CNH's 'Lights On!' fundraising campaign! Help us turn the lights on! Collingwood Neighbourhood House is growing and we need your help! This summer, we will open a 10,250-square-foot Annex in the striking Wall Central Park development at Boundary Road and Vanness Avenue. 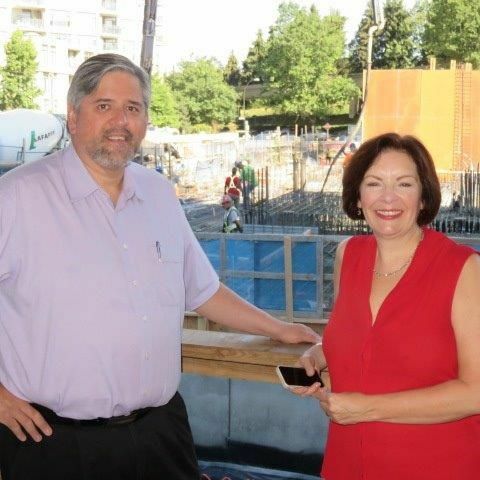 Our Neighbourhood House on Joyce Street is over 20 years old and we are grateful to the City of Vancouver and the Wall Financial Corporation for this much-needed community space in our rapidly densifying neighbourhood. Collingwood Neighbourhood House must raise funds to open and maintain our beautiful new space. One of our fundraising activities is an online auction and your contribution towards our $200,000 Lights On! Campaign fundraising goal will help us offer much-needed community programs as soon as we open the doors! • Expanded arts and cultural programming, including arts displays, an art studio, performances, and dance classes of all kinds in the large multi-purpose space with a sprung floor. • Cooking, nutrition and food preparation programs in our 950-square-foot commercial-grade kitchen from where we also hope to provide catering to groups renting the multi-purpose space and increase our revenue. • Provide meeting, social and performance spaces for local residents. Our neighbourhood is becoming more of a vertical community of condominiums and apartment towers like Wall Central Park where the Annex is located. In this new space we can expand our reach and deepen our approaches to building community in towers. We hope you’ll join our Lights On! campaign by providing goods or services for our auction. Your support for this beautiful new Annex will help us to provide more classes, space for cultural rehearsals and performances, and rental space for parties, baptisms and even weddings in Renfrew-Collingwood! For more information about the auction, please contact Collingwood Neighbourhood House Board Directors Stephanie Baufeld or Patricio Ibarra at CNHAuction@gmail.com. Thank you for your attention and support! Together, we’ll turn on the lights and make our neighbourhood even more vibrant!